Ready... Set... ROAR! Alpha is another fine, if stagnant, offering from a pack of alternative metal survivors. Sevendust are a great, great band, but they’re beginning to run thin on creative juices. They’re still going steady since their debut release ten years ago, delivering a solid album every two years or so that plays to their strengths: cascading nü-metal guitars, plenty of angst, and oh, one angry but melodically winning black frontman in Lajon Witherspoon. Alpha is their sixth full-length to date, and finds them both welcoming a new guitarist to the pack, Sonny Mayo, and uncertain where to go from 2003’s accessible Seasons and the un-channeled aggression of 2005’s Next. While merely describing it as ‘business as usual’ would be both unfair and frank, that’s the album in a nutshell. A good three quarters of Alpha's contents is devoted to that red-faced emotion -- there’s always the apparently unfriendly split with their ex-axe-grinder or the record company to add fuel to the fire when breakups or past experiences can’t be relied on, but, aside from a few incendiary moments, every number comes and goes being pretty well hookless. Backing vocalist’s John Connolly’s raspy screams rub off as an annoying extra, though they weren’t before. The songs bleed into each other like never before, even though the dominant Witherspoon’s teeth-gritted force is as usual top of the game: there’s perhaps not another singer in rock who sounds like he does. Beginning with the muddily dull “Deathstars”, the rest of the 7D unit thrash as hard and as basically as their fingers will allow -- no synthesizers or turntabling here -- including borrowing some compositional tools from extreme music’s most mainstream-friendly act, Slipknot. That deserves cookie points for what it is, but it sounds more like they’re paying tribute than creating music. That said, there’s a period of pretty intense drumming that should go down well live in “Clueless”, itself an ambiguous pummeling of hypocrisy, matched with pretty, powerful melodies and crunchy riffage, and “Feed” gathers momentum from a roll that takes it right through to the last, predictably meatiest chorus. A handful of soaring solos interject the chug-chug-chug at designated points. The record still has somewhere further to go on its rampage before cooling down. On “Suffer”, Sevendust sound genuinely peeved, but also clunky and leaden, while “Confessions of Hatred” entrusts more power to the bass guitar... even if it just makes them sound like Korn, kicking off with a spoken monologue and a two-note riff before exploding into stop-start polyrhythms. “Aggression” is the only time they display any real tenderness in nearly an hour of music – technically a ‘power ballad’, courtesy of the ever-reliable guitars, it all the same follows the band’s typical template for writing soft songs, plus a piano. Even Witherspoon, streamlined back to normal voice, sounds bored, venting his own achingly hurt lyrics: “You never thought I’d be”, Witherspoon calls, “Cutting you apart again!” roars Connolly in reply. “Burn” is probably the highlight of the whole set, and is a prog rock song more than anything else, the longest of the band’s catalog. Riding in on a reverberating intro that starkly contrasts the rest of Alpha, light, speedy drumming gives the track its sprawling backbone. The call and answer vocals are in place (“I don’t know what I want, but I know -- I don’t want this!” is one of the more visceral lines), setting up a panicky, melodic chorus. Just when it should finish at the 5:30 mark, it hits a low piano note and is given rebirth by tom-toms and samba beats straight out of Radiohead’s OK Computer. A mood-enhancing piano passage follows, putting a sorrowful twist on the theme and allowing its nine minutes to fade out gracefully. 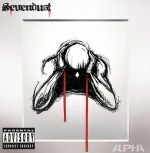 Alpha is a good album: if it were a debut by another band it would seem masterful, but Sevendust might yet prove to be nü-metal’s Soundgarden -- with their best days behind them and ready to move on. Maybe ex-guitarist Clint Lowery was wiser in seeing this than Witherspoon is ready to admit. The band are very prolific, keeping up the frantic pace as well as presumably finding time to tour behind each new disc, but aside from “Burn”, Alpha has no new ideas, and while still worthwhile, it is unfortunately the band’s least special album in their decade of existence. Which gives rise to the age-old question once again: is it better to burn out than to fade away?